It started snowing at midnight and hasn't stopped yet. We did close at 2 PM today. CDOT closed Highway 6 at Keystone and we were concerned about the slide paths that affect the road. 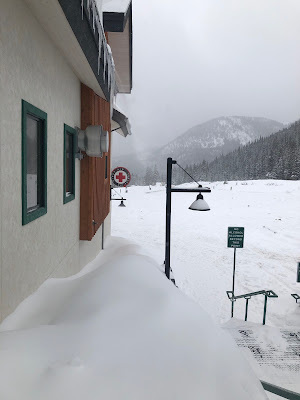 Tomorrow, at dawn's early light, A-Basin and CDOT will begin avalanche mitigation work along the highway and within the ski area. We are hoping for a normal or near-normal opening Thursday, depending on the mitigation results. Stay tuned to our website and the blog for details. I will update the blog by 8 AM Thursday.